A police reservist who supplied a firearm that was used in the K1.2m airport robbery has been identified and will be arrested by NCD Police leading the investigations. Police revealed that 4/5 other suspects who were involved in executing the robbery will be arrested as well this week after CCTV footage captured them during the heist. Police confirmed no monies were recovered as yet but are confident that when arrests are made, they will attain vital information on the stolen monies. 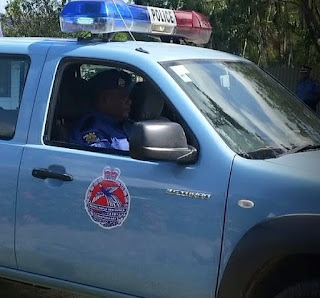 The firearm used in the robbery was recovered at a senior police officers house in one of the barracks in Port Moresby. Meanwhile city cops have raided certain parts of the Gerehu Suburb in pursuit of criminal elements believed to be involved in the K1.2m robbery. Lead investigators from Boroko Police Station said despite no arrests been made during the raid, they have carried out an awareness as well on the dangers of getting involved in criminal activities and encouraged youths to be proud of their country and refrain from such activities as police will hunt them down. “The aim of the awareness was purely to discourage crime as such activities were sending the wrong signals to the international community around the world and would really taint the image of our beautiful country.